As autumn sets in, I thought I’d take a quick look back at one of my favourite beers of the past summer: Mac’s Interstate APA. Blurb on the bottle: Highways criss-cross America from sea to shining sea, helping us get super-sized truckloads of Mosaic and Citra hops down from the Pacific Northwest to send to New Zealand. Mac’s: The 1980s were momentous in bringing Kiwis world cups, Goodbye Pork Pie, and the rise of music videos. They also happened to be when Mac’s came along, with its natural curiosity helping change the landscape of beer for good. The review: Surprisingly, for a beer at the cheaper end of the scale, Mac’s Interstate APA tastes pretty legit. It’s satisfactorily astringent, with a citrus hop kick that belies its alcohol content. In fact, I’d dare say that it offers exceptional value for money, because there’s no lack of hops here. I must have drunk a dozen or more over the summer, but always out of the bottle, so I can’t comment on the colour of this beer. 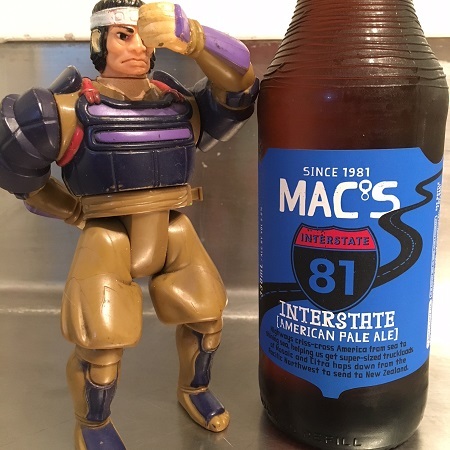 However, I can tell you that Mac’s Interstate APA is medium-bodied – it’s not as oily as Mac’s Green Beret IPA, which I also like – and goes down a treat after a day at the beach (hence why it was my go-to beer of the summer!). The verdict: I might lose a bit of street cred for saying this, but I’m quite a fan of Mac’s beer; it’s cheap and tasty. Mac’s Interstate APA is no different. Beer/movie combination: The name of this beer conjures up images of the great American road trip. There are so many appropriate movies to choose from, but one of my favourite road trip movies is the original National Lampoon’s Vacation.